Posted June 24, 2014 by Heather Michet & filed under Medicinal Plants, Plant Talk. Commonly seen along roadsides and in disturbed areas, St. John’s Wort’s delicate leaves and flowers are misleading in how much healing power this plant offers. The plant earned its name because of its blooming time being near St. John the Baptist’s birthday, June 24th, also known as St. John’s Day. ‘Wort’ is an old English word for plant and ‘perforatum’ in its botanical name refers to the tiny holes in the leaves. Used for centuries in early religious, pagan, and native rituals, it was believed to have the magical powers of chasing away demons and other bothersome spirits. 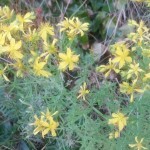 The Greeks and Romans used St. John’s Wort for snake bites, melancholy, wound healing and menstrual cramping. The herb was often placed beneath the bed pillow before sleep as an invitation for St. John to visit the sleeper in dreamtime – and hopefully offer a blessing. There are two prominent varieties of the plant: the one growing in the wild with small, dainty yellow flowers and the hybridized one used for landscaping (highway medians are a popular site) that looks like a succulent (see photos). The domesticated plant has flowers approximately 3″ in diameter and leaves that range up to 4″ in length. It is the native plant that is gathered and used for medicinal purposes. The entire plant dies back in winter, then bursts forth new growth in early spring after having spread its roots to create additional sites for the plant. One way to identify the wild plant is by pinching and rolling one of the flowers between two fingertips. If a purplish red residue is the result, you’ve been anointed by this delightful plant. The flower buds are used as an herbal supplement suggested most frequently for mood enhancement. St. John’s Wort Oil is created by infusing the flowers in a fixed oil, yielding a rich, ruby colored healing gem that can aid with skin conditions (e.g. burns, including sunburn, bruises, and scarring), pain relief (e.g. neuralgia, sciatica) and inflammation (e.g. sprains). Learn more about this oil, its uses, and about products that contain it here. Safety: St. John’s Wort can increase sun sensitivity in some people. Avoid excessive UV exposure (e.g. sunlight, tanning beds) when using this product. Pregnant and breast-feeding women should refrain from use of this plant, its oil and any products that contain it. Consider reaching for this plant’s help when you have skin issues, nerve pain or injuries resulting in inflammation. Those dainty yellow flowers pack a mighty healing wallop.